It’s been a while, but we are continuing our comparison reports on some of the most popular and competitive routes in the world. In the midst of our recent travel planning we noticed the great variety of carriers travelling between Hong Kong and Bangkok. There are 9 main competitors that run the city pair, formed of Thai Airways, Emirates, Sri Lankan, Royal Jordanian, Kenya Airways, Hong Kong Airlines, Bangkok Airways, Cathay Pacific and Orient Thai. We have picked the most comfortable and business practical of the 9 carriers. We have already whittled this down to five, taking out Bangkok Airways, due to its connections through another airport, Royal Jordanian for its seat comfort, Kenya Airways for the inability to book this leg separately, and Orient Thai, as it’s an economy only carrier. That leaves Thai Airways, Emirates, Cathay Pacific, Hong Kong Airlines and Sri Lankan. To make it easy we have highlighted our winners from each category in bold. Seat Layout Could be anything, Thai operates a mixed fleet on the route, using 747s, 777s and A330s, but mainly expect 2 x 2 x 2 or 2 x 3 x 2 configuration. Their crowning glory, the A380, featuring a mind boggling 76 business class seats, in an all-aisle access 1 x 2 x 1 configuration A majority of the flights are on their regional A330s, (although occasionally on their international aircraft) the 44 seats are configured in a 2 x 2 x 2 arrangement 1 x 2 x 1 seating configuration, similar to that found in Etihad or Air Berlin. The carrier operates the A330 200 and 300 on this route. There is a minimum of 32 seats per aircraft. 18 seats in a 2 x 2 x 2 layout. Meaning some passengers (window seats) won’t get aisle access. Thai is starting to introduce flat beds on certain 777 aircraft, so opt for these for most comfort, otherwise expect an angle lie flat bed. Amazing seat comfort, similar to Hong Kong airlines on this route, plenty of space, and privacy. best seats are the ones closest to the windows. 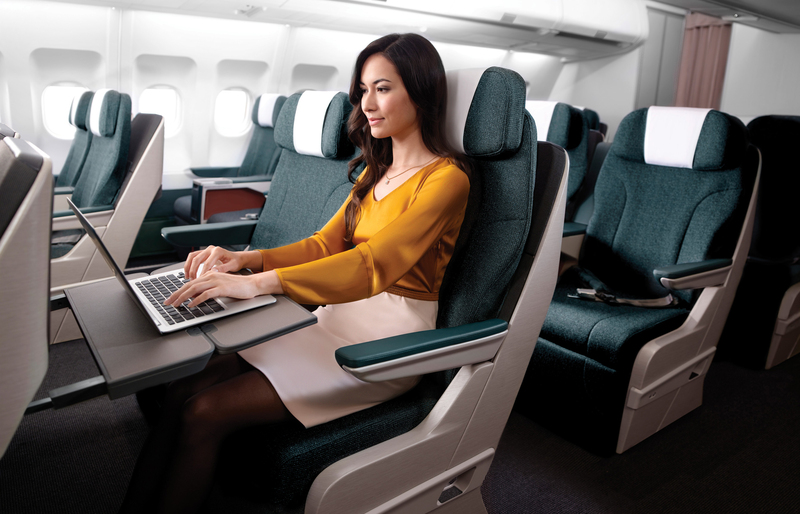 We are surprised to see Cathay mainly offer these deep recliner seats on a prized route, whereby internationally they offer the best business class, seats are comfortable, but only for short flights. We love these seats, which offer great privacy and comfort, the 1 x 2 x 1 configuration means everyone gets aisle access too. Lots of storage space. The fleet offers two kinds of business class, a fully flat bed type, and a recliner type. The fully flat bed is comfortable and semi-coccooned in a fixed shell. So many different seat configs, but expect angle lie flat beds, which are more than enough on this short route. Fully flat beds well over 6 foot long and just over 19″ wide 21 inches wide, with 45 inch seat pitch and a generous recline 6ft 1in long and 20in seat width Unknown sadly, but expect an industry standard. AVOD onboard, with decent sized monitors and a good selection of movies to pick from. A huge library on their ICE system, with hundreds of movies and tv shows. They also have very affordable WiFi. A 12.1″ touchscreen AVOD entertainment system with StudioCX, a wide variety of old and new movies and entire TV Shows. A 15.5″ TV Screen filled with 100 Hollywood blockbusters and extra TV and music programming that is updated and refreshed every 2 months. AVOD onboard, but reports have suggested the controller is a little difficult to use. Thai’s Cuisine is exceptional normally, and by far one of their best service elements. You will be spoiled for choice. A great selection of international dishes, and on this shorter flight expect an edited lighter menu. Cathay offers exceptional dining in business class, even on regional trips. This is their strongest point here. A mix of Chinese and Western dishes, try the Chinese Duck with Hoisin Sauce if it’s available. Sri Lankan offers a mix of healthy and high quality meals. Expect a good wine selection onboard. Bangkok Suvarnabhumi airport is the home to Thai airways, so expect excellent lounge offers and great ground service. Emirates has their own dedicated lounges in both Bangkok and Hong Kong, award winning amenity kits and chauffeur services. Cathay has amazing award winning lounges both in departures and arrivals in Hong Kong and excellent onward connections. Amenity kits are excellent too. Slippers on board, always a nice touch, and on the ground, in Hong Kong the Club Bauhinia offers an international lounge atmosphere with showers and WiFi As the carrier is operating out of it’s main base here, expect shared lounges and very little ground service, but being a member of One World, there are miles earning opportunities here. We have quite rightly placed Emirates at the top of the list here, as their onboard product is far superior to that of their rivals on this route. 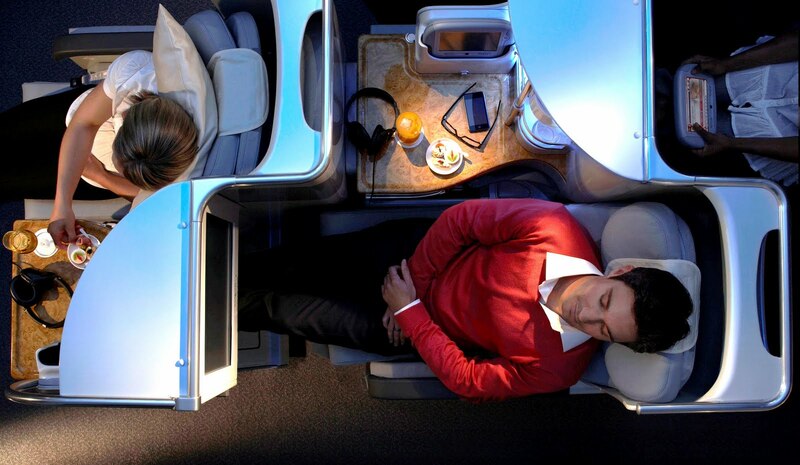 The only downside to Emirates’ product is the fact there is only one flight a day, which may detract certain business customers, but their very low price point also makes it a very appealing choice. Considering this being the home routes of Cathay, Thai Airways and Hong Kong Airlines, with much larger frequencies, both Cathay and Thai offer fairly inferior products, to that of Sri Lankan, Hong Kong Airlines and Emirates, and in the case of Thai Airways, with the large variety of aircraft used on the city pair, the experience can vary quite a lot depending on which flight is booked. Cathay’s regional product is also not as good against their rival Hong Kong Airlines which has opted for a fully flat bed on the short hop. Cathay would naturally win based on their Hong Kong Lounge offerings, but Emirates has actually managed to have their own branded lounge in both destinations, even though their home is back in Dubai. This is another very nice touch. This month’s comparison just shows that sometimes it is worth checking out non-home-town airlines when you are looking at a trip. Can’t say I totally agree. 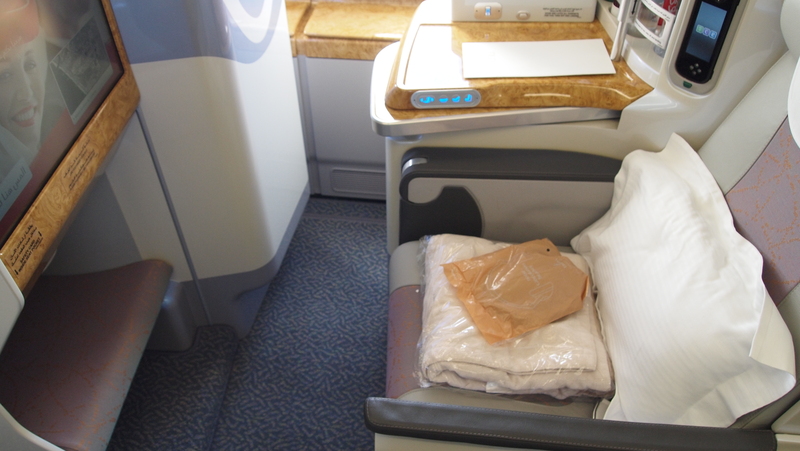 For a 3 hour flight, the lie flat seat doesn’t do too much. I still wouldn’t put CX any higher on the list, though, cause I agree they have poor catering and other ‘soft’ amenities compared to its competitors for this route. EK has its own branded lounge in HKG and BKK. But the HKG lounge really cannot be said to be up to scratch either. In respect of price and performance I’d rate Hong Kong Airlines as my first priority thanks to its wide range of flights throughout the day, means you have greater flexibility in rearranging your schedule. The catering itself is decent as they are now featuring InterContinental Hong Kong and Blue Elephant Bangkok in business class menu; and of course, you will often get a nice bargain from their business class deals. There is no doubt Emirates’ skybar/personal mini bar is a big selling point but think about their flight schedule I will not prefer having half a day spent in travelling back to Hong Kong. 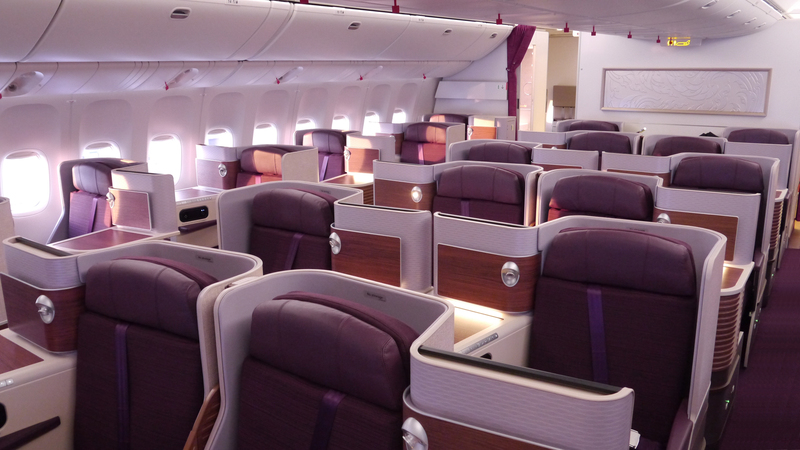 In places, Emirates, Hong Kong Airlines and Thai Airways are sharing the same business class product with minimal modification such as color tone and IFE brand, so I am happy with any of these three airlines as long as I can get what I need in good value.